Cases in Online Interview Research is a companion book to Online Interviews in Real Time, the topic of a 2010 Reading Group seminar. 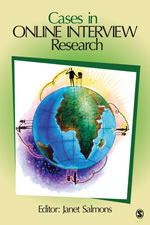 Last year I wrote a book called Online Interviews in Real Time, available from Sage (See: http://tinyurl.com/einterview). This book focuses on synchronous interviews conducted with or in text, videoconferencing, virtual worlds or meeting spaces. Some of you participated in the Reading Group seminar about the book. I’ve edited a companion that is coming out next fall: Cases in Online Interview Research. (See: http://tinyurl.com/e-interview2 ) The new book contains 10 multi-disciplinary cases of research with data collected from mostly synchronous interviews. Each case is followed by two commentaries-- one by another book contributor and one from me, using an “E-Interview Research Framework” as the basis for my analysis. The “E-Interview Research Framework" is a collection of models and key questions; I created this framework to further develop and organize materials introduced in Online Interviews in Real Time. My purpose is to offer some guiding principles for people who are designing research or who are reviewing proposals for, or completed studies that include, online interviews. Both web conferences will take place in the SCoPE Blackboard Collaborate room. Part 3: Interviews and Observations: Conducting Research in Virtual Worlds.